Pittsburgh, founded in 1758 and with a current population of 334,563, welcomes more than 10 million people each year to its historical sites, modern attractions and parks. Surrounded by the Allegheny and Monongahela rivers which join together to form the Ohio River, Pittsburgh is a scenic city with more bridges and trees than any other major U.S. city. For couples looking to enjoy Pittsburgh's views and outdoors, here are some ideas on where to go and what to do. 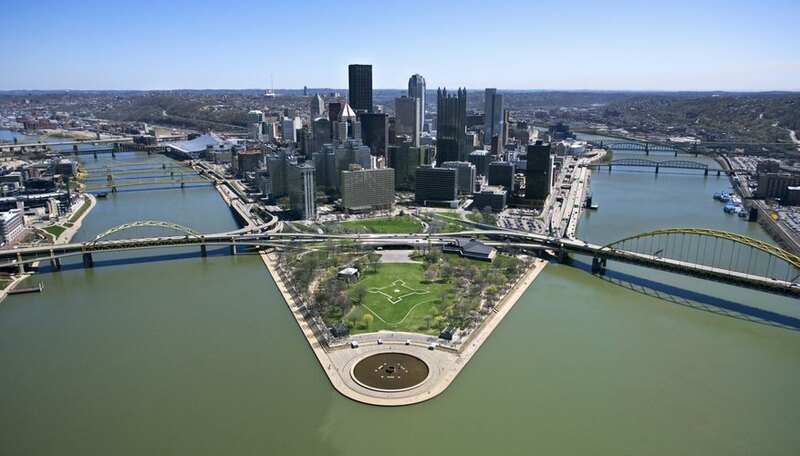 Pittsburgh is home to many parks and outdoor attractions ideal for romantic dates. Built in 1877, the Duquesne Incline is a historic cable car that takes visitors to the top of Mount Washington for views of the city's skyline. The observation desk, 400 feet above the city, offers panoramic views of downtown Pittsburgh and the surrounding rivers. Besides the observation deck, a museum showcases historic photographs of Pittsburgh and inclines from around the world. Open from early morning to after midnight, couples can time their visit to watch the sun rise or set over Pittsburgh. Within the rolling hills of Schenley Park are numerous walking trails, a golf course, tennis courts and even an ice-skating rink during winter. Couples can picnic or eat a light lunch in Schenley Park Cafe's shaded patio. The park is also home to the Phipps Conservatory, a Victorian 13-room glasshouse featuring different varieties of tropical plants. From summer to fall, butterflies fly around in the Stove Room. The conservatory also has an outdoor garden containing smaller gardens, streaming fountains and shaded benches. The walkways of Allegheny Commons, Pittsburgh's oldest park dating back to 1867, are shaded with different varieties of trees including the Chinese Chestnut, American Elm and Sycamore Maple. Besides taking a walk, there is the option to kayak Lake Elizabeth, a shallow lake in the northwest corner of the park. The park is also home to the National Aviary which features endangered and exotic birds in their national habitats. On Fridays from May to November, the Citiparks Farmer's Market sells food and fresh flowers perfect for a picnic. Station Square is a 52-acre entertainment, dining and shopping complex across from the Monongahela River. Set in an open-air environment, couples can stroll along the Riverwalk, shop and dine at one of more than 20 restaurants. Many of the restaurants have outdoor seating. From late April through early November, a multicolor fountain show choreographed to music entertains crowds at Bessemer Court. At the end of the night, couples can take a horse and carriage ride around Station Square. Lac, Karen. "Romantic, Outdoor Date Ideas in Pittsburgh, Pennsylvania." Dating Tips - Match.com, https://datingtips.match.com/romantic-date-ideas-pittsburgh-pennsylvania-7955584.html. Accessed 22 April 2019.